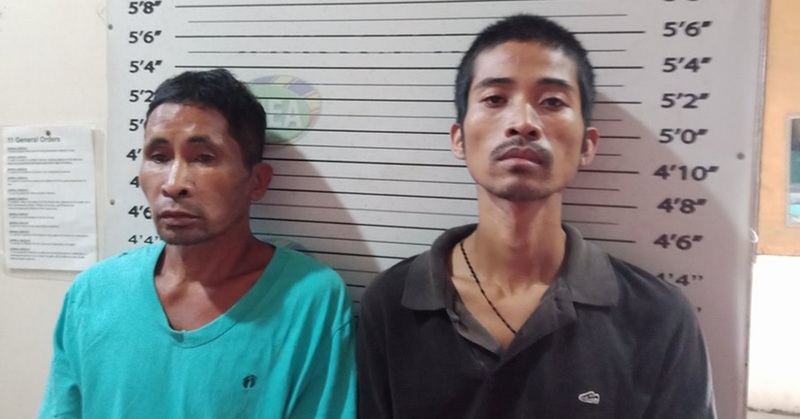 Suspects Tranquilino Ochea (left) and Ryan Echavia (right) were arrested during a drug buy-bust operation conducted by the Philippine Drug Enforcement Agency in Barangay Mansasa, Tagbilaran City at 2:15 p.m. on Monday. A 36-year-old man, who was allegedly spotted selling illegal drugs by Philippine Drug Enforcement Agency (PDEA) authorities, and his 47-year-old uncle were arrested by the agency’s operatives on Monday afternoon. Both suspects were arrested in a drug buy-bust operation conducted along V.P. Inting Avenue in Barangay Mansasa at past 2 p.m. The PDEA identified the buy-bust target as Ronald Ryan Echavia and his uncle as Tranquilino Ochea. In a report, authorities said that PDEA agents spotted Echavia as he was selling illegal drugs prompting operatives to set up the arrest. Echavia then allegedly sold shabu worth P10,000 to an undercover agent but Immediately left and headed towards his house after the sale. PDEA agents pursued Echavia and cornered him inside the house where they also chanced upon Ochea, authorities said. Two more packs of suspected shabu and a digital weighing scale were seized from the suspects upon arrest. The confiscated illegal drugs were estimated to be worth P75,000, the PDEA said.